Wood floors are beautiful and durable, making them a popular choice of flooring in both commercial and residential locations. However, over time wood floors can lose their beauty if they are not maintained properly. The benefits to regularly scheduled professional cleaning of your wood floors is first to keep your floor's appearance level at it's best all the time and second to eliminate the need to ever have to go through the 3-4 day hassle and expense of re sanding your floor. TruRenew Clean will properly clean and educate you about the regular maintenance for your wood floor. It will protect and add value to your investment of hardwood flooring. The cost to replace or sand and finish your hardwood floor is very expensive and disruptive. Proper maintenance will add years to your floor. It will add beauty to tired looking floors and bring back the luster to the floor. It will do this without the usual dust and long term odor associated with traditional recoating methods. We will provide you with a product and service that is unmatched in the hardwood floor industry. Call one our Customer Service Representatives today to schedule a free on-site inspection by one of our Wood floor Specialist to see if your floor is a good candidate for our services. When household cleaners fail to work time and time again, TruRenew Clean offers Wood Floor Cleaning, which may just be the perfect solution to your problem. Our wood cleaning solvent gently removes dirt, while using a low speed rotary bonnet extraction method. Our solutions will break down dirt and grime without harming your hardwoods while bringing back the luster and original shine to your home. Most wood floor cleaning companies are claiming to seal or recoat your floors, therefore still applying the same acrylic wax product to your floors that caused your original problem, many calling it a polyurethane. Part of what we offer for wood flooring is our TruRenew Wood Floor Renewal; something our customers love. It provides a deep clean and renews your wood floors to a “like new” finish at a fraction of the cost of sanding and refinishing. Before you decide to invest in sanding and refinishing your hardwood floors, give our team a call. Our wood floor process gently removes the layers of hazy, cloudy white wax buildup on your flooring down to the polyurethane. Many of the hardwood floor care products available, such as wood soaps and mop-on type finishes that are available at your local home improvement stores, make claims about keeping your floors looking shiny but the results are not long term. Yet, over time, the acrylic wax builds up and creates a shell like surface layer, this causes your surfaces to look dull and hazy. Not to mention they can end up sticky to the touch with white wax buildup unlike the approach and products we use to successfully take care of the process. 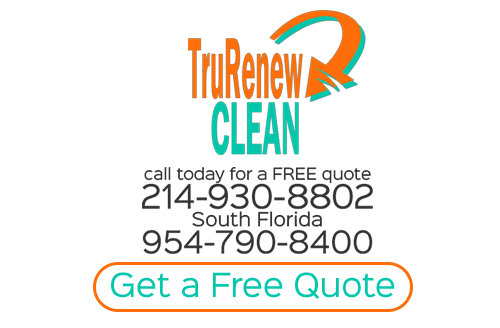 TruRenew Clean will give you all the available options to achieve the results in which your desire, but educating you with the proper cleaning techniques. 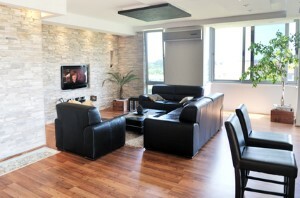 If you are looking for Wood Floor Cleaning Services then please call 214-930-8802 or complete our online request form. "When Cleaning Just Won't Do Renew!"